Posted by V the K at 2:04 pm - June 30, 2017. Gavin Newsom is a whinging girly-man, and probably the next Gobernador Maximo of Venezuela del Norte. Posted by Jeff (ILoveCapitalism) at 2:02 pm - June 30, 2017. Yesterday I noted Project Veritas’ video of Van Jones calling Trumprussia a nothingburger. Commentor CrayCrayPatriot kindly pointed us to Jones’ response. It’s the kind of response I’ve seen from lefties many times, over the years. I thought I’d analyze it. Changing the subject to Sarah Huckabee Sanders and President Trump. Deceptively editing his own words, to create a different meaning after-the-fact. Changing the subject to Jones’ own astuteness in declaring that Russia is a nothing-burger and we should be talking about other things. Undercover journalist: What do you think is going to happen this week with the whole Russia thing? Van Jones: The Russia thing is just a big nothing burger. VJ: There’s nothing there you can do. Note the middle bit – Jones saying YEAH, it’s REALLY a nothing-burger. Also Jones’ last sentence, re-affirming “There’s nothing there,” nothing “you can do” with it as it is destined to stall out. Interviewer: “What do you think is going to happen this week with the whole Russian thing? Aside from the omitted middle section, Jones subtly changes the words (adding or deleting a couple). He makes it better for Jones. He creates an impression that, in an interview, he was only sighing and lamenting people’s powerlessness to do anything about the undeniable Trump-Russia collusion which of course he believes in because it’s so real. Except that’s not what he said. So once more, a leftie is caught – and his response is to spin and deflect, distort and divert, knowing the yokels will give it credit. And yet I’m not impressed. Jones’ spiel leaves a lot of openings. It takes only a little critical thinking, to penetrate him. Posted by V the K at 11:52 am - June 30, 2017. Remember when Barack Obama gave a middle finger salute to his political opponent? Remember when Barack Obama referred to working class Americans as xenophobic bitter clingers? Remember when Barack Obama said that the police were stupid? Remember when he said they were racists? Remember when Barack Obama bashed Christians over events that happened hundreds of years ago? Remember when Barack Obama blamed Christians for slavery and Jim Crow? At the National Prayer Breakfast, no less. Remember when Barack Obama compared the Republican Caucus to terrorists and extremists? What I don’t remember is apoplectic fits of self-righteous indignation from the media. In fact, almost all of them defended his nasty remarks and gestures; or at least gave him a pass. I guess it’s because Obama directed his nastiness at Republicans and working class Americans. Posted by Jeff (ILoveCapitalism) at 11:50 am - June 30, 2017. A producer of Chris Cuomo’s show, Jimmy Carr, hates President Trump? No problem. Because that is his right. But he goes on to state that the American voter is “stupid as sh*t” and that “90%” of his CNN colleagues share his views. 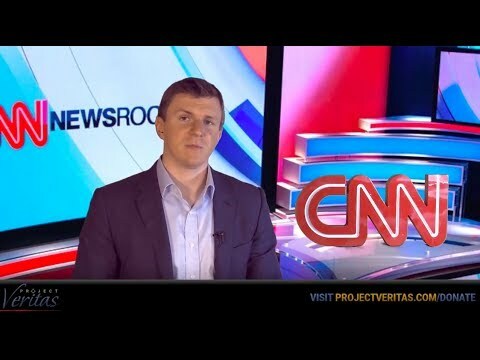 And O’Keefe goes on to show CNN distorting yet another of their voter panel interviews with selective editing. This isn’t news – I mean, we knew all this. But here it is, in our faces. CNN is a propaganda machine. Not even close to an objective or trustworthy news organization. Posted by V the K at 10:13 am - June 30, 2017. This is the political culture that produced Nancy Pelosi and Kamala Harris. It also gave us Donald Trump. Pedro Figueroa-Zarceno, 33, reached the settlement agreement with the city attorney’s office, said Saira Hussain, a staff attorney at the Asian Law Caucus who represented Zarceno. BTW, the Republican Majority House of Representatives yesterday passed legislation that would slightly reduce taxpayer subsidies to Democrat-Controlled Urban Zones (Sanctuary Cities) that violate Federal Immigration law. Posted by V the K at 12:57 am - June 30, 2017. 1. I like that he doesn’t let himself be a punching bag for the Democrat Media Complex. The last two Republican presidents seemed to think that defending their administration’s policies from Democrat attacks was ungentlemanly. Trump has also identified the weak point of the Media Establishment — their egos. Most of the media operatives, especially on television, are dumb, vain, and egomaniacal. Trump knows that if he pokes them, they will go into paroxysms of “How Dare He Criticize Us” vituperation. He provokes the very media temper tantrums that discredit the media. 2. I like that some of Obama’s executive overreach has been repealed, and that some of Obama’s worst policy decisions are being revoked. We’re out of the Paris Redistribution of Wealth to the Third World Accords. Criminal aliens are being deported once again. Israel isn’t being treated as a Pariah state. More please this. 3. Neil Gorsuch was an outstanding Supreme Court appointment. Good Lord, can you imagine the horrible people Hillary would be putting on the court? Sotomayor and Kagan were bad enough. Try Justice Kamala Harris on for size. (Not that it would be her, but it would be someone just as hard left, just as hyperpartisan, and just as corrupt). Democrat presidents never nominate swing votes. Now, three things what I don’t like about Trump’s presidency so far. Posted by V the K at 10:24 pm - June 29, 2017. So… what exactly were those two gay guys about to do to that chicken? Posted by Jeff (ILoveCapitalism) at 11:20 am - June 29, 2017. It’s fun to watch President Trump troll the media. And MSNBC’s pompous, unhinged Joe Scarborough and Mika Brezeznski deserve it as much as anyone. But this is too much. (The link is just the first tweet of a two-part tweet.) Trump gloats over his past social snubbing of Joe and Mika as she struggled to recover from a facelift. Come on, Mr. President. Your internal rhymes are neat and it’s funny…for a blogger, or a cartoonist, or some Millenial in his mom’s basement. But you’re none of those things. Keep it classy. At your level, people’s personal issues should be off-limits (just like their kids). Bait the dummies over politics and their Fake News addiction. I don’t think you owe them an apology; but you probably owe us (the People) a small one. For lowering your office. UPDATE: Just to round out the picture. WaPo has background on the Joe-Mika-Trump feud. Hannity has a reel of low points from Joe’s TV show, including his poor music video. So in fairness, Trump’s feelings may be justified. But please, Mr. President, don’t gossip about people. Not even your opponents. Don’t do personal feuds. Posted by V the K at 8:42 pm - June 28, 2017. Slate goes after gay people who are off the liberal-democrat plantation. The community is already divided, and everyone under the LGBTQ umbrella doesn’t belong in the same political tent. There are gays who would rather cheer on cops and corporations than support their fellow queers in valid protest. There are gays who would rather safeguard their billion-dollar fortunes and embrace an admitted sexual predator (they mean Milo Y) than pick up the mantle of LGBTQ equality. There are gays who feel more affinity with straight, homophobic racists than with other gays. We’re bad because we don’t fall in line behind the Democrat banner; unlike the good gays like Larry Brinkin, Terry Bean, and Ed Murray. Posted by Jeff (ILoveCapitalism) at 2:28 am - June 28, 2017. As Rush, Hannity, etc. have been pointing out lately, eight months of baseless Trump-Russia collusion allegations seem finally to be blowing up in the faces of the Democrats, Controlled Media and Deep State. In a recent poll, 73% of Americans said the investigations are causing Congress to lose focus, 64% said they’re hurting the country, 56% said it’s time to move on, and 52% said they don’t believe Trump did any collusion. And the story itself is taking a few turns. First, I’d like to give the background on something called the Trump Dossier. It’s a salacious report on candidate Trump that was put together (in 2015 or 16?) by a former British intelligence agent, Christopher Steele. Steele was paid to produce the dossier by a company called Fusion GPS. Many suspect that Fusion GPS was paid ultimately by Democrats and/or #NeverTrumpers, and was hired precisely to do a hit piece (something shoddy and salacious). The dossier was passed to the FBI and other U.S. agencies. Although they knew it was false in its most serious claims (or should have known), they appear to have used it as a basis for investigations on Trump and as a roadmap for questioning witnesses. Also, some suspect that the Obama administration may have used the dossier to obtain their secret FISA warrants and/or NSA surveillance on Trump, during and after the 2016 campaign. We need to know on that last point because, *if true*, it would be explosive: one would have to “connect the dots” of Hillary or DNC paying a foreigner for a bogus report on Trump, Obama using the report as a bogus reason to spy on candidate Trump, Susan Rice “unmasking” the data and distributing it within the Obama government, and then leakers possibly leaking Trump campaign secrets to media, DNC and/or Hillary. Quite a trick. It’s backfiring on the Democrats because at long last, the Senate Judiciary committee is investigating Fusion GPS and who was behind the bogus dossier. Next, I’d like to discuss The Washington Post’s blockbuster article last Friday on Russian election hacking, a game-changer. WaPo is known for “burying the lede”: putting a title/frame on a story that tries to mask the important revelations within it. This article is titled “Obama’s secret struggle to punish Russia for Putin’s election assault”. Thus, WaPo’s frame is: Russian election hacking is real and isn’t Obama a lonely hero for having tried to punish Russia? But the article’s details tell a different story. Everyone agrees, still, that Russia didn’t change a single vote. In that respect, the 2016 election was perfectly fair and un-hacked. The CIA did report to Obama in 2016 that Russia was trying to do cyber-crime on various U.S. targets, including both the DNC and RNC. For five months, Obama dithered and considered various responses and, in the end, he did…nothing. Until after the election (when he expelled some Russian diplomats, tightened some sanctions, and fanned the flames of protest and questioning Trump’s legitimacy). Still no evidence. The WaPo article doesn’t actually provide any. After Wikileaks Vault 7 (including revelations that the CIA itself routinely hacks things and leaves Russian fingerprints), there is no reason to take the CIA’s word on anything – without evidence. Also, Russia could have tried to hack into stuff – but with little or no effect. It is still exceedingly odd that the DNC denied FBI investigators access to their computers after the leaks. Instead, the DNC spoon-fed the FBI a report on supposed Russian hacking from another shoddy, DNC-paid company, CrowdStrike. It is all the more strange and inappropriate that the DNC didn’t let the FBI in to look at their servers and network, after the alleged “DNC email” hack. The Russian interference was routine (see above); much less of a deal than WaPo is now making of it? Obama didn’t want to draw attention to Hillary’s corrupt Russia dealings? He didn’t want to draw attention to Democrats having serious problems with security; like, you know, Hillary’s e-mail scandal? He didn’t want to draw attention to Hillary’s hypocritical interference in Russian elections? He said many groups inadvertently abetted Russia’s campaign, including Republicans who refused to confront Moscow and media organizations that eagerly mined the troves of hacked emails. In other words, damn the American people for opening their eyes and reading those 100% genuine DNC emails! In short: If WaPo’s story is true, then instead of Trump-Russia collusion, we should be looking at Obama-Russia collusion and Obama-Hillary collusion. This is the game-changer. Trumprussia was always “mostly bullsh*t”, as we learned Tuesday. The real story would be if the Russian government interfered in U.S. elections – and President Obama let them. Then made a big deal of it later – just to undermine President Trump. Now *that’s* attacking American democracy. Someone in the government spread around the fake Trump dossier (when they should have ignored/discredited it). The DNC hid an alleged crime scene from FBI investigators. Susan Rice wrongly “unmasked” data on domestic political opponents. Obama failed to do a thing about Russian interference; until it was time for him, and various Deep State leakers, to undermine a lawful new President whom they just didn’t like. Posted by Jeff (ILoveCapitalism) at 5:20 pm - June 27, 2017. It’s less clear if Bernie himself is under investigation; but he could be, as the question of whether he improperly pressured the bank also needs looking into. I’ve also seen allegations (that I haven’t confirmed) of Jane Sanders possibly handing out jobs and money to friends and family and taking a nifty $200,000 severance when she left BC in 2011 (prior to its 2014 bankruptcy). None of this is a surprise. Here at GP, we notice endless examples of left-wing hypocrisy. And I’ve long seen through the self-serving nature of Bernie’s behavior and comments. For example, in 2016 I noticed that he would condemn left-wing political violence – in a superficial way that deflects the blame to others; not meaning it. Posted by Jeff (ILoveCapitalism) at 3:33 pm - June 27, 2017. Filed under: Big Journalism,Liberal Lies,Media Bias,Trump-hatred,Unhinged Liberals,Where's the Scrutiny? This post started as part 3 in my series this month, “How fake is CNN? At least this fake.” (Most recent entry here.) Because of CNN’s fake Trumprussia story that they had to retract. And because of Project Veritas catching that CNN producer who agrees that CNN’s coverage of Trumprussia is “mostly bullsh*t” with “no proof”. Attkisson: Democrats, Republicans and the media Establishment have exempted themselves from the normal journalism rules…because they see Donald Trump as such a big threat. They would say, a Hitler-esque threat. That means they don’t have to follow the normal rules of journalism in this case. I think it’s more of a threat to the system of favors, money and access that has been developed [with] the political establishment. Carlson: So it’s not just a conventional left-right thing, where they’re liberal, Trump is conservative, they hate him. There’s something different going on. Attkisson: Washington survives on a system…of access and money where people have spent decades paying in to certain politicians, Democrats and Republicans alike, to make sure certain political hearings don’t happen, to make sure certain laws have provisions written in. All of the sudden, overnight, all that access they’ve bought, all the hard work they’ve done as lobbyists and so on, is almost worthless – if Trump’s reality of Washington comes into play. And nobody seems to like that. …I liken it to the situations that must be in North Korea. If you have a TV and can watch the news, it’s gonna be a version that’s approved and put out by the State. In some respects, we are getting an artificial reality created by people putting out narratives…If you’re like me, there’s very little that I see reported on the news that I instantly believe without doing my own checking because so many formerly-reputable news organizations have been proven to be 180 degress wrong, not just a little bit wrong… reporters doing things that wouldn’t be allowed in journalism school, but doing them now with impunity. Posted by V the K at 9:27 am - June 27, 2017. Slate lays out the case for infanticide. Posted by V the K at 9:07 am - June 27, 2017. On Airstrip 1, MiniTru is going to close down an Orthodox Jewish Girls School for refusing to reach its pre-pubescent children the state’s Mandated Curriculum on the Celebration of Alternative Lifestyles. A private Orthodox Jewish elementary school called the Vishnitz Girls School in Hackney, north London, is facing closure by the British government because it does not include curriculum that teaches children about homosexuality and gender reassignment surgery. According to Heat Street, a report by the Office for Standards in Education, Children’s Services and Schools (Ofsted) says that the Vishnitz Girls School does not teach its 212 attending children — aged three through eight — “a full understanding of fundamental British values.” [Emphasis Emphasized]. The Lesbian, Gay, Bullying Totalitarians (LGBT) have pushed a similar law in California. War is Peace, Freedom is slavery, Diversity is Strength. Posted by V the K at 8:17 am - June 27, 2017. Can you think of forms of protest more stupid than “Queer Dance Parties?” I’m kind of scratching my head over that one. Also, the NEA is giving $20,000 in taxpayer dollars to finance a musical about a lesbian illegal immigrant. I’m disappointed PDT hasn’t put a stop to this kind of idiotic waste. Posted by V the K at 8:05 am - June 27, 2017. CNN ran a fake news story accusing a Trump business associate of being a Russian agent and very quickly had to retract the story. The Democrat Media Operatives behind the story have been sacked, but those responsible for sacking the people who have just been sacked should also have been sacked. And a CNN producer is on tape saying that the Trump Russia story is “Mostly Bullsh*t” and they are just hyping it to get ratings. Mostly? They aren’t really hyping it for ratings, though. They are hyping it because they hate Trump, they can’t believe their dear Hillary lost, they want to help their Democrat allies, and the journalistic pack mentality says they must push the vaporware of the Trump-Russia scandal. CNN is on in one of the break rooms at work. There has not been a single time in the last six months when I have passed the TV in there, and it has not been CNN bashing Trump. Anti-Trump propaganda seems to be all they ever do, unless it gets briefly interrupted by a terrorist attack or a shooting (until they discover the shooter wasn’t a Republican/NRA member, then, it’s back to Trump-bashing). On that note, here’s CNN reporter Jim Acosta throwing a tantrum at a recent White House press briefing. Posted by V the K at 1:29 pm - June 26, 2017. The Supreme Court of the United States has reinstated most of the PDT Administration’s temporary restrictions on travel from six (Iran, Libya, Somalia, Sudan, Syria and Yemen) unstable, politically chaotic states where terrorism is a problem. Despite left-wing talking points to the contrary, immigration bans have been highly effective in protecting large cities like Tokyo from terrorism. Meanwhile, in multicultural London, the “bridges not walls” people are now building walls on their bridges to protect their pedestrians from Mohammedan psychopaths practicing the hot new vehicular jihad fad. The increased scrutiny the PDT Administration would like to subject travelers entering from sketchy states seems like a reasonable precaution. Hell, the TSA will soon be inspecting your reading material before you board an aircraft. Why do we let people from dysfunctional terror states in with far less scrutiny? California is instituting a ban on government travel to states that hold politically correct views on illegal immigration and transgender bathrooms. No leftists are upset by this. Some travel bans are more equal than others. The SCOTUS has also agreed to hear a case to determine whether Wedding Cake Fascism is Constitutional. With the four left-wing justices plus Anthony Kennedy, I don’t think this case is going to work out well for Liberty.